Heat the oven to 200C/180C fan/Gas 6. Heat a deep non-stick frying pan over a high heat and toast the bread for 2 minutes. Remove from the pan and set aside. Reduce the heat, add the oil and gently fry the onion, garlic and broccoli for 5 minutes until softened. Return the bread to the pan and scatter over half the feta. Whisk the eggs, milk and mustard together and pour over the egg mixture. 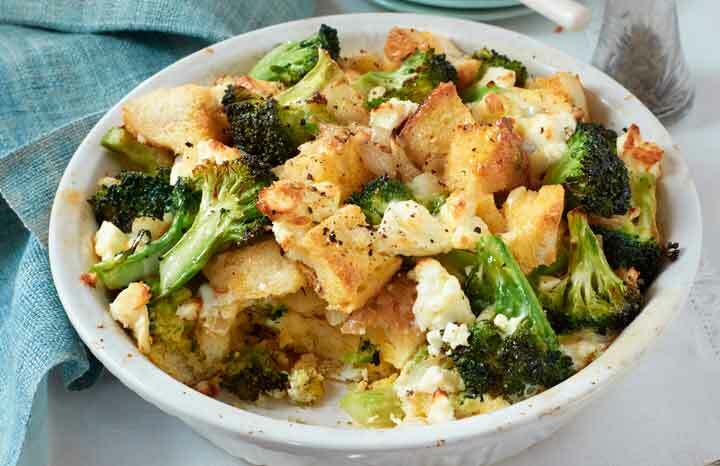 Sprinkle with the remaining feta and transfer to the oven to bake for 15-20 minutes until golden and cooked through.